My daughter turned twelve this summer, and thoughts of homeschooling high school and preparing for college admission have been swirling around in my head. As someone who likes to plan ahead, I decided doing research now would help calm my worries. 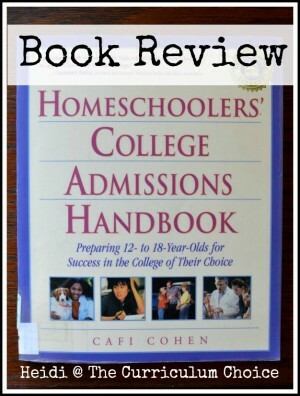 That’s when I came across the Homeschoolers’ College Admissions Handbook by Cafi Cohen. I’m so glad I read this book now, because it gives me an overview of what we should be doing in the years ahead and helps me move forward confidently. The author compiled lengthy survey results from 32 homeschool parents and 14 homeschool graduates about their college admissions experiences. Within the book you’ll find text boxes with lengthy quotes from the survey responses. It’s like being able to sit down with people who’ve been there and done that–and have them tell you HOW they did it! The Homeschoolers’ College Admissions Handbook was written in 2000, and I imagine that as homeschooling has expanded so have the options for homeschool students applying to college. Luckily there is advice about talking directly to the colleges your child is interested in and keeping up-to-date on admissions criteria. The tagline for the book is “Preparing 12- to 18-Year-Olds for success in the College of Their Choice.” The colleges from the survey responses ranged from community college all the way to Harvard. It’s reassuring to me that as a homeschool mom I can help my children be ready for whatever their aspirations are after high school! I remember my Mom consulting this book. Helpful, yes, but much has changed in the college landscape in the last 14 years. The rise of digital education and the plethora of ways one can earn college credit, not to mention updates to the SAT, are just a few of the ways that the homeschooling high school and college admissions process has changed.